When in the presence of greatness, we must remember that Rob is only a local celebrity, hard as this is to imagine. However, there are times that Rob comes in contact with celebrities of a national nature. This was their time to experience the man we know as "Rob". Erin Murphy is better known to most people as "Tabitha" from "Bewitched". Rob met her at Chiller Theatre in Seacaucus, NJ, about a week after (coincidence or wishcraft? - you decide!) I had come across her own (as in, really, her own) web site: http://www.tvtoys.com/bewitched/. Unlike many people who meet her, Rob did not ask Erin to wiggle her nose with her finger (besides being unhygenic, imagine how YOUR nose would feel if you wiggled it with your finger a hundred times or so per day!). Although Erin had previously appeared at Spooky World in Berlin, MA, it is unlikely at this time that she'll be making an appearance there in 1999. This is a picture from Rob and Erin Murphy's second meeting - in Boston in July 1998 (but this time I was the photographer). Erin is a warm, funny, friendly person - her cheery attitude and great smile won over everyone who had the fortune to meet her that day. I'll always have an image in my mind of of Erin leaning over at one point and asking me "What's an assimilated tribble?" (It's a Star Trek thing if you don't get it - actually, it's two Star Trek things). Erin had participated in a show called "Fashion Emergency" on "E". After checking out her website, which includes many pictures of her personal appearances as well as meeting her in person, I would have to say that she is no fashion victim or emergency. She looked great and her outfit was outstanding. I don't think it's a coincidence that someone started the Completely Unofficial and Unauthorized Erin Murphy Site. 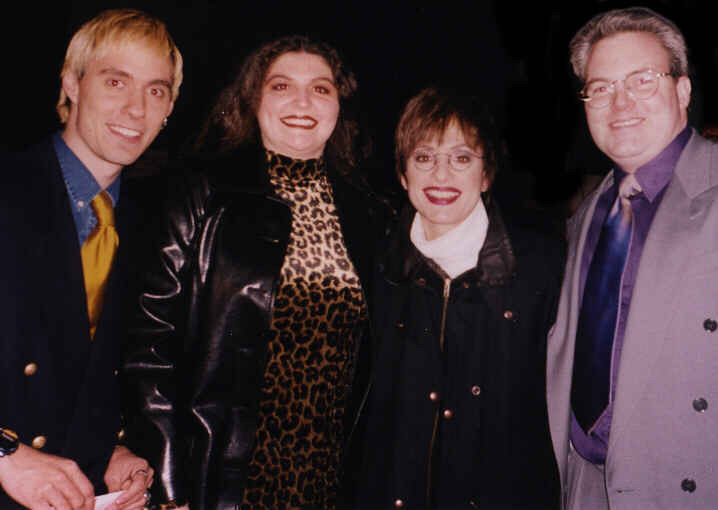 Bryan Fortin (pictured at left), a friend of Rob's, had met Erin her at Spooky World in October, 1997. Bryan has his own cable show called "Zones of Evil". You can check out the Web site for his show here. Rob has seen everything that Marjean Holden has ever done. You can tell that this is the same Chiller Theatre experience, as Rob has on the same "Shakespeare's Sister" shirt he had on when he met Erin Murphy (way to dress, Rob). I must state for the record, though, that Rob has not met anyone from "Shakespeare's Sister". 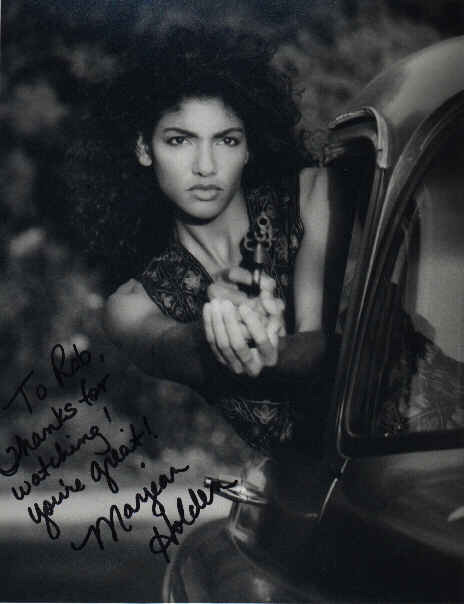 Marjean was good enough to give Rob her autograph. The text reads "To Rob, Thanks for Watching! You're great! Marjean Holden". Isn't that amazing? She thought Rob was great and I didn't even have to tell her! Click on the image to get the full-size version. 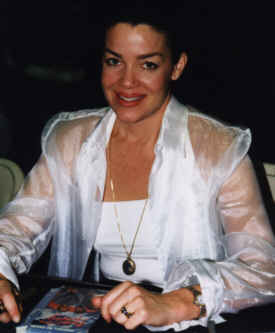 Anne Lockhart has done lots of voice work and has made many appearances as a special guest star on different shows. She was Sheba on Battlestar Gallactica! Sheba! 'Nuff said (except that this is again the Chiller Theatre expo, since Rob is still wearing that Shakespeare's Sister shirt). Rob, when Sheba is paying you UNDIVIDED ATTENTION, do not look down at the floor! Rob got autographs from both June Lockhart and Anne Lockhart. You must remember June Lockhart from Lassie, Lost in Space, Petticoat Junction and C.H.U.D. II. And if I didn't mention it, Anne Lockhart was Sheba on Battlestar Galactica! Sheba! 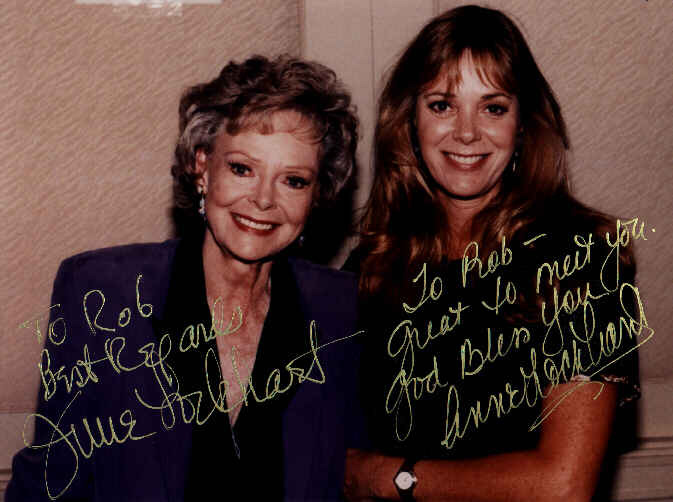 June's signature says "To Rob, Best Regards June Lockhart"; Anne's signature says "To Rob - Great to meet you. God Bless you. Anne Lockhart". I'm not sure if she stole the part about "To Rob" from June's signature, but she included the words "Great", "God" and "Anne" in her signature. Curiously missing was the word "Sheba". If you don't recognize this picture then you can just go home now, thanks for playing. 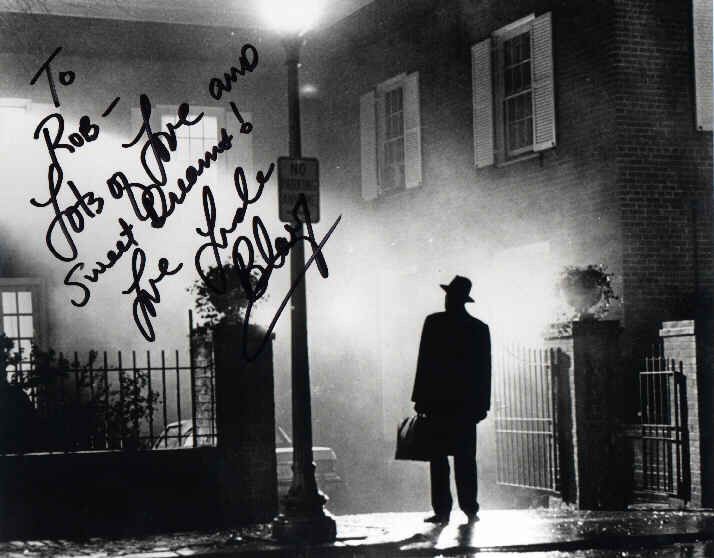 Linda Blair signed this picture for Rob. The signature says "To Rob - Lots of Love and Sweet Dreams! Love Linda Blair". Linda lists a URL for her official Website, but I prefer the one listed by the IMDb, even though both are done by the same person. You can check out the site HERE. Rob wasn't able to get this picture taken. 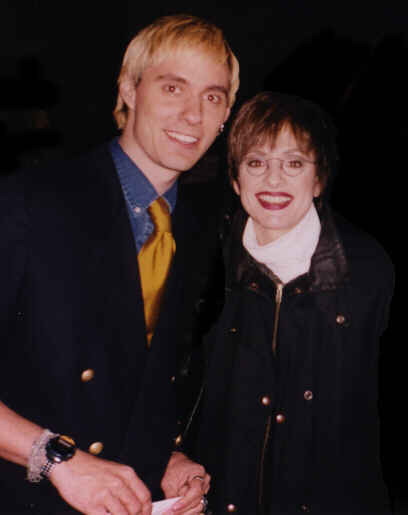 They only had time to take one picture and Rob wasn't able to get close enough to Patti LuPone, so I created this picture for him from the below picture. Sure it's photographic fakery, but at least I was able to make the picture he couldn't take. I was able to find her unofficial home page. This is the original picture. Technically, this one has been reworked as well. There was a person in the background as well as a truck that had to be removed. The four people shown, however, are quite real and appear as they did that night. Erin Gray is a stunning individual. In the time we were able to meet her, she told us stories of the days of Buck Rogers, extolled the virtues of Tai Chi and told us some stories of raising her own child. She has her own domain now that includes a number of pictures as well as her upcoming personal appearances. In addition, check out this site dealing with domestic abuse - I learned on an on-line interview that Erin is involved with the site. Claudia, I kept my promise (even she doesn't know what I'm talking about). You should check out Claudia Christian's Official Web Page. She has pages on merchandise, her appearance schedule and more. I must say - she was a really good sport when she experienced the regeneration of the assimilated tribble. 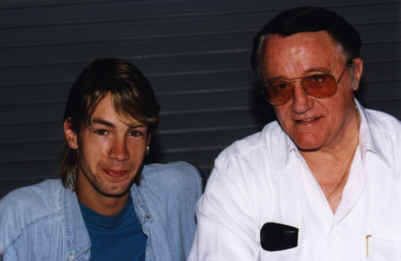 Bryan got to meet Robert Vaughn. 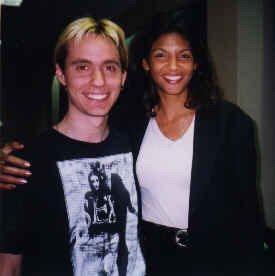 This picture was taken at the Boston Expo in July 1998. This page was last updated August 29, 1999.
you can go back to my main page.